Why is brushing your teeth so important? 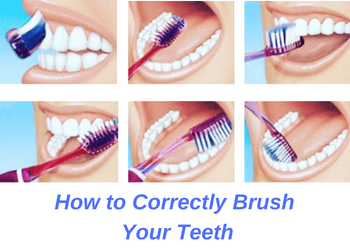 What is the correct way to brush my teeth? What is a good toothbrush to use? If you’re not brushing your teeth properly, you’re placing yourself at risk for developing cavities, gum disease and dental infection. 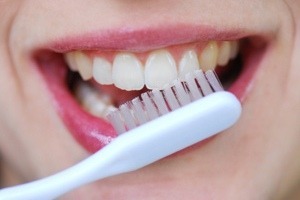 Brushing your teeth regularly helps remove food particles from teeth surfaces. This keeps your teeth and gums clean and healthy. If you don’t brush your teeth, food and plaque gather on your teeth surfaces. Gradually, this buildup calcifies and forms a substance known as tartar or calculus. Tartar is very hard and sticky which makes it impossible to remove from your teeth by yourself. Plus, tartar harbors harmful bacteria which produce harmful acids. This acid byproducts destroy your teeth, gums and jaw bone. As a result, if you’re not brushing your teeth properly, you’re placing yourself at risk for developing cavities, gum disease and dental infection. We recommend using the Bass Brushing technique. Our recommended brushing method is known as the Bass technique. Start by holding your toothbrush at a 45-degree angle against your teeth surfaces. Press your toothbrush firmly against each tooth surface. Then start brushing with gentle, circular strokes. Apply enough pressure to remove plaque particles but don’t press too hard of you’ll damage your teeth. Once you’ve finished brushing each tooth surface, re-position the toothbrush on the next surface. Continue until you’ve covered all teeth surfaces. Be sure to capture all teeth surfaces including the ones against your tongue and in the back of your mouth. For an even cleaner mouth, brush your tongue surface at the end of your brushing routine. The biggest advantage of an electric toothbrush is that the brush performs the oscillation motion. Both manual and electric toothbrushes can be very effective so long as you use them properly. The biggest advantage of an electric toothbrush is that the brush performs the oscillation motion. This makes brushing your teeth easier and cuts down on your effort. However, you still need to pay attention to cover each and ever tooth surface, brush for the recommended two minutes and apply the right amount of brushing pressure. Be sure to use a toothbrush which has soft bristles. Hard bristles are abrasive and damage your teeth and gums with repeated use. Switch out your toothbrush or the electric brushhead every 3 to 4 months. Using an old toothbrush or brushhead for too long exposes your teeth to harmful bacteria. Plus, worn out toothbrush bristles become abrasive and damage your teeth and gums. If you prefer to use an electric toothbrush, we recommend Oral-B or Sonicare. If you choose to go with a manual toothbrush use one from a proven brand with soft bristles.